Courtesy of WOWSA, Calais, France. Jabez Wolffe made over 20 unsuccessful attempts to swim the English Channel, although he later became a well-known, globally respected coach, trainer and author. 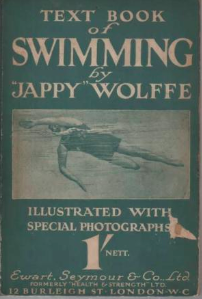 In his book entitled Text-Book of Swimming published in 1914, Wolffe writes about some of his most memorable attempts. “I certainly ought to have succeeded the first time. I could not have asked for better conditions. For after several disappointments, and any amount of consequent irritation, July 18th 1906, dawned a perfect day. The sea had been very high, but was going down fast, and when I waded in off the South Foreland, at 11.39 am, the sea was described as being like a sheet of glass. The course mapped out by my pilot was designed to set me on the French side of the Varne shoal inside six hours. With everything so favourable at my very first attempt, and with the admonitions and headshakings with which my proposition to cross in two tides had been favoured, I naturally laid myself all out to my task. The Varne was passed well inside the alleged impossible time, and in 7 hours I had gone 15 miles, 12 of which were on the direct course. I felt very pleased and elated, and full of strength and vigour, and suppose that I succumbed to my feelings. Anyway, I must have spurted up tremendously, for just after this my left leg gave out. The pain was fearful, and as I rely almost entirely on my left kick every stroke was an agony. Wolffe also recalled his next few attempts, “This was, perhaps, a foolish attempt under the circumstances. The weather and water conditions were all right, and these tempted me; but it was, honestly speaking, not giving my leg a chance. That damaged limb did its best , but had to surrender after 3 hours and 55 minutes. My leg was the principal cause of failure on the third attempt, while on the fourth occasion I had the misfortune to be overcome by biliousness." But it was his fifth attempt that can tantalizingly close. “This was positively wicked luck. To get so near and then to fail, was terribly cruel. I got off all right, and travelled along well and comfortably despite the hindrance consequent on my getting mixed up with a shoal of mackerel. Then we got into a fog and lost our bearings. We got straight again, but I had gone out of my course. A bad time or two followed, but I pulled through them all right and felt determined to win. I had zig-zagged a good deal owing to the thick mist, and so had been a long time about it. The two tides chance had gone, but I was certain I could do it with three, when a strong head wind sprang up, and increased in force every minute. I got close in, within three-quarters of a mile, they tell me, and they say also that, from the Sea Wolf, they could plainly see the lights in Calais Harbour. My attention was fully taken up with the buffeting I was getting from the waves, which was getting worse every moment. Brickett and the others saw that the attempt was hopeless, but I resolved not to fail "now" if I could help it. Another 45 minutes of it and I was found to be nearly 2 miles from shore, the wind and tide beating me out faster than I could fight my way in. It was heartbreaking almost, but there was clearly no use in straining myself to no purpose. A 15¼ hours' swim against a strong sea and wind, and a sprained wrist, and a close view of Calais all I had to show for it. On the sixth attempt I was 9 hours 39 minutes in the water, covered 25 miles, and was only four miles from Cape Gris Nez when the weather became so bad that it was unsafe for me to attempt to continue. [The seventh battle] was my second nearest try. They brought a grammaphone along this time, which I found very useful, but the Channel called in a stiff wind and big waves, and scored again. Early on, my enemy called in a shark as well, which was a bit cowardly, and scarcely in the rules of the game. The monster ally evidently thought so himself, for he rested satisfied after giving me a good thump, which made me painfully sore for several days afterwards. It wasn't a pleasant experience by any means, but preferable to what came along later. I made a fine passage to within 4 miles of Sangatte, despite a pretty severe buffeting, but from there onwards the Channel evidently made up its mind to do its worst. Two miles further in and the sea got right up. My pacers and I had several narrow escapes of being dashed against the small boats, and it became clear that the tide and sea would only carry me out faster than I could work in. Eleven hours and a half, 22¼ miles covered, and 1¾ miles only from my destination. Believe me that I would never have given in had there been the least chance of success. Channel swimming is an expensive business, so I left the Channel reluctantly, in the hope of having my revenge later on."